Surviving four kids! : School Station Revised - All Aboard!! School Station Revised - All Aboard!! A while ago I did a post about my 'school station' , it was working well, but we needed that big shelf set for all the books we have. 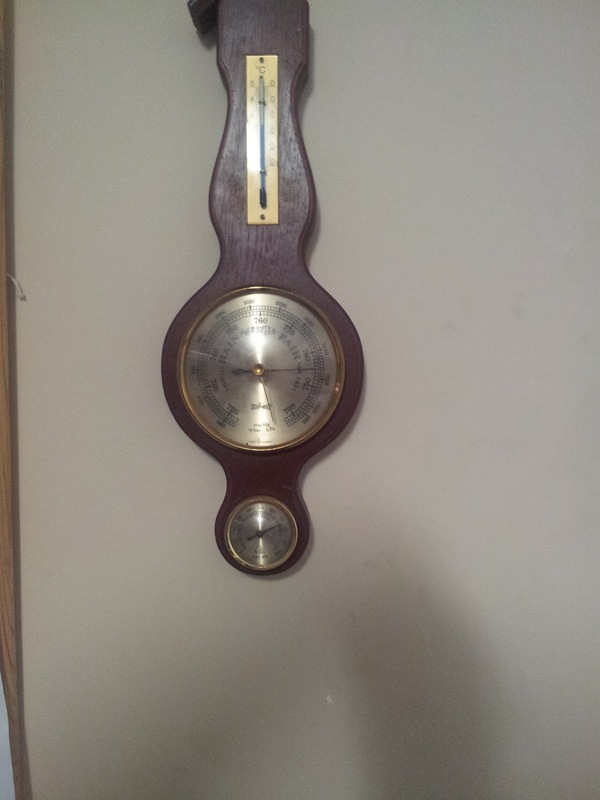 So, hubby grudgingly cleared some room in the Garage for me. This is what we have come up with. We had these little shelves floating around basically being unused. So, we tipped it on it's side. The bottom cubes are for homework and library bags. 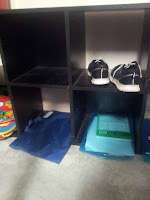 The top cubes are for school shoes, and school bags are placed on top. The red box on top is the library books that need to be returned to the library. (Note to self, return library books!). 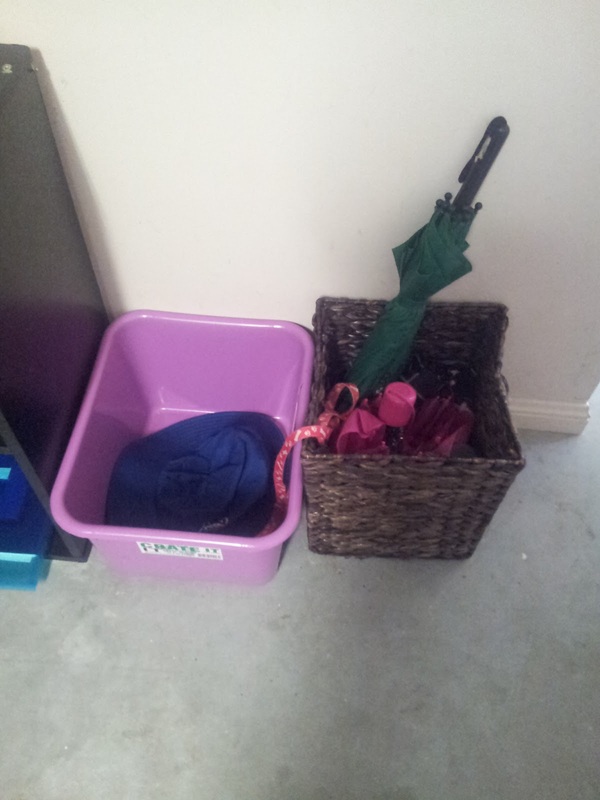 The purple box on the right, is for school hats. Next to that is a basket with umbrellas in it for rainy days. On the wall above, we have a barometer, so the kids can learn to read the temperature for the day, and know if they need jumpers or what not. 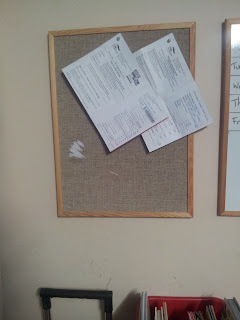 Then there is a big notice board. 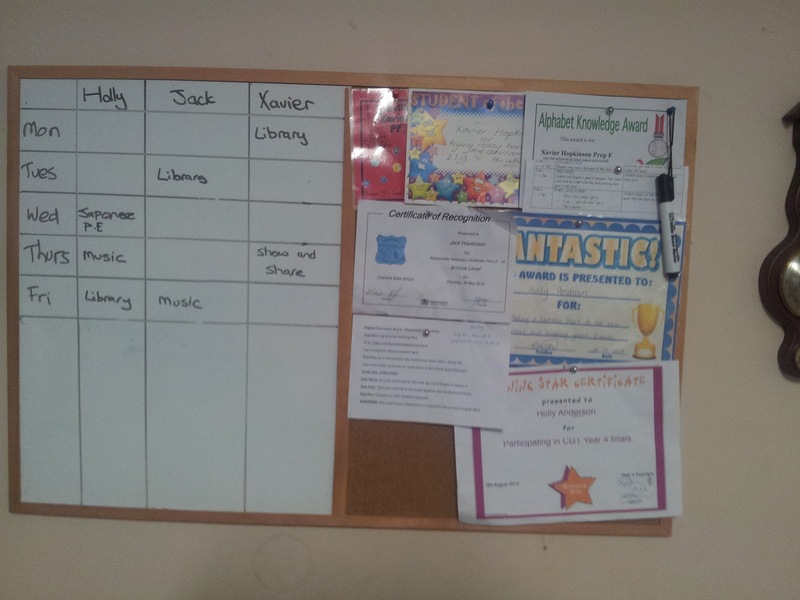 The pin board is where we display all their certificates and things they are proud of. They get rotated often. The white board has 3 columns, Holly, Jack and Xavier, and each column has room for each day of the week going downwards. So we can jot down music day, library day, Japanese day, sports, etc etc. Nothing gets missed that way. Finally, there is a separate notice board. That is my notice board for things I need to remember. At the moment, I have their school photo slips ready for them to take in at the end of the week on photo day. So there you have it. This is working much better for us, by unloading everything before they come inside, there is less clutter around the house (in theory). Also, they take their shoes off before going inside, so they don't drag the dirt and sand inside. Im thinking about adding another little box for dirty socks too and they are often covered in dirt and grass. And another box with clean white socks to pop on before school. All in the one place equals easy access and nothing lost in the last minute dash out of the house..... well, once again, in theory. 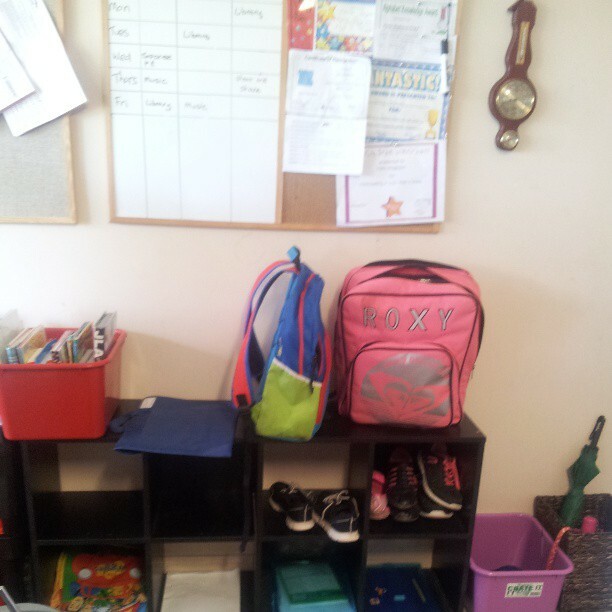 How do you organise your kids school things? Do you have school station or access point? This is such a brilliant idea! I only have one but I need to be this organized (although its actually my husband who need the organizing!). Blog every day in May!